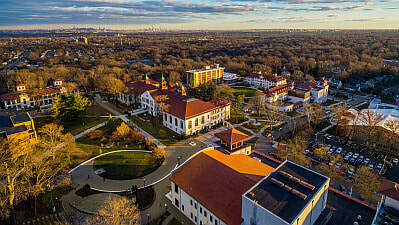 Founded 1908 as a Normal School to train teachers, institution became Montclair State Teachers College in 1927, Montclair State College 1958, comprehensive multi-purpose institution 1966 and designated as teaching university under present name 1994. Second-largest graduate enrollment of state-supported colleges behind only Rutgers. Ranked #169 of National Universities, #90 in Top Public Schools, #19 in online Master of Arts in Educational Leadership degree program in the nation 2019 US News & World Report. Nine colleges and schools with more than 300 doctoral, master's and baccalaureate level programs, nearly 300 majors, minors, concentrations, and certificate programs, include master's degrees in business, education and fine arts. Some 60% of undergraduates women, over a third of all students African-American or Latino, described by US Education Trust as a “Top Gap Closer” for increasing graduation rates for minority students. Most popular majors biology, psychology, business administration, English and home economics. College of the Arts offers more than 50 majors, minors and concentrations in art and design, television and digital media, communication studies, dance, music and theatre, frequent collaborations with noted artists, performers in NY-NJ metro region. Global Education Center helps arrange student and faculty exchanges, scholarly visits, conferences and seminars; Institute for Advancement of Philosophy for Children attracts scholars to learn about application of logical thinking to elementary school classroom, operates Professional Development School in Newark, in partnership with Newark Board of Education, and teacher education program selected to participate in national reform effort to improve schools and preparation of teachers. Center of Excellence in Fine and Performing Arts offers performing arts students graduate and undergraduate program combining professional training with career entry.. Special facilities include Allan B. DuMont Television Center, state-of-art broadcast facility; Distance Learning Room; NJ School of Conservation in Stokes State Forest (Branchville). Actor Bruce Willis attended, received honorary degree, alumni include former Newark Mayor Sharpe James; late Congresswoman Marge Roukema; TV personality and former Assemblyman Steve Adubato. Susan Cole named president 1998, previously president, Metropolitan State University in MN, former senior vice president at Rutgers.